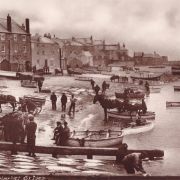 The history of the St Ives lifeboat goes back to 1840 when the town’s first purpose built lifeboat, Hope, was acquired. 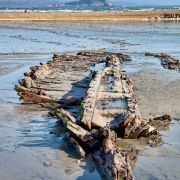 Prior to this rescues were made using various boats such as pilot gigs, as was the case in the 1838 rescue of the schooner Rivals. 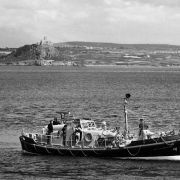 The lifeboat was manned by a volunteer crew and operated by a committee of townsfolk. The bravery of the men who crewed these early lifeboats can barely be imagined. These were large rowing boats with no radios, no cabin and they would often capsize during rescues in huge seas. 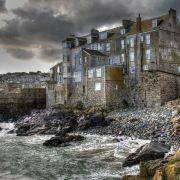 It was over 20 years before the RNLI took over the running of the St Ives lifeboat and the first lifeboat-house built. 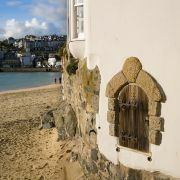 For some reason the boathouse was built on Island Road near Porthgwidden beach, meaning the lifeboat would need towing through the town’s streets before being launched off the Sloop. Over the years there have been three further boathouses; in 1867 on Fore Street, in 1911 on the Quay (now a restaurant) and in 1994 across the road from this with a new, purpose built slipway. 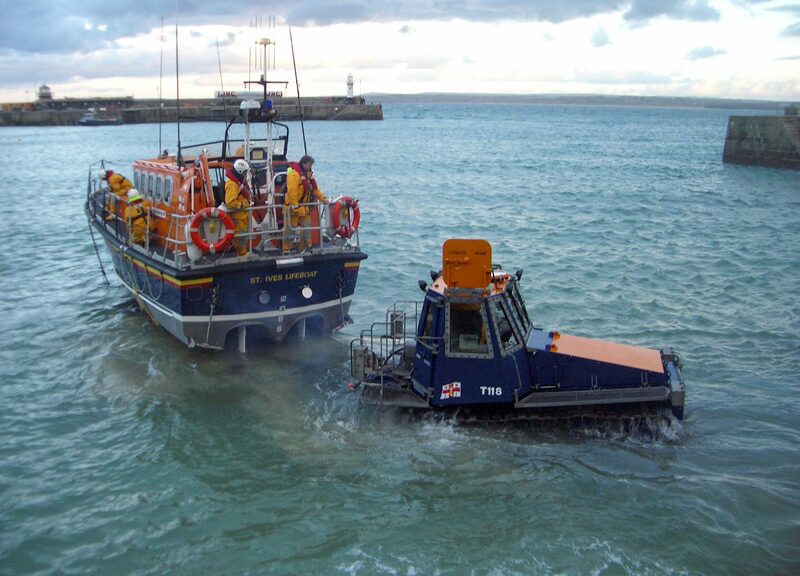 The launching procedure is still somewhat convoluted with a special launching tractor required to tow the Mersey class lifeboat into sufficiently deep water on most tides. In 1933 the first motor lifeboat, Caroline Parsons, was introduced. This was partly in response to the closure of the Hayle lifeboat station and the increase in area now covered by the St Ives boat. On 31st January 1938 the Caroline Parsons was launched to go to the aid of the 3,700 ton steamer, the SS Alba. Seeking shelter the Alba had headed into the exposed Porthmeor beach mistaking the lights for those of the town. The lifeboat managed to get all 23 of the crew off the ship on the first trip. However, the lifeboat capsized and with her engine out was washed onto the Three Brothers rocks. Whilst the entire lifeboat crew were saved five of the crew of the Alba were lost. The Caroline Parsons was smashed on the rocks. It is almost ironic that after this incredible escape, less than a year later disaster should befall the crew. On the night of the 23rd January 1939 a force 10 gale was blowing. 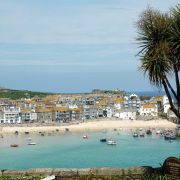 Reports of a large steamer in trouble off Cape Cornwall had come in and the Sennen lifeboat was unable to launch due to the state of tide. So at 3 o’clock in the morning the St Ives lifeboat, John and Sara Eliza Stych, was launched into the darkness. The motor boat was crewed by eight men including coxswain Tommy Cockings. 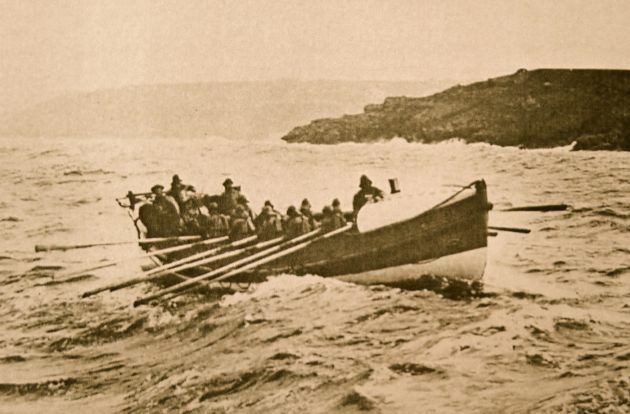 As they rounded Clodgy Point the lifeboat capsized in heavy seas. Being built to self-right the boat did just that but four of the crew were lost. Unable to start the engine the boat drifted back towards the Island where they dropped anchor. But the rope broke and the boat capsized again. This time only three managed to get back in the boat. From here the lifeboat began to drift across St Ives Bay towards Godrevy Point, capsizing for a third time. Only one of the crew, William Freeman, managed to stay aboard. 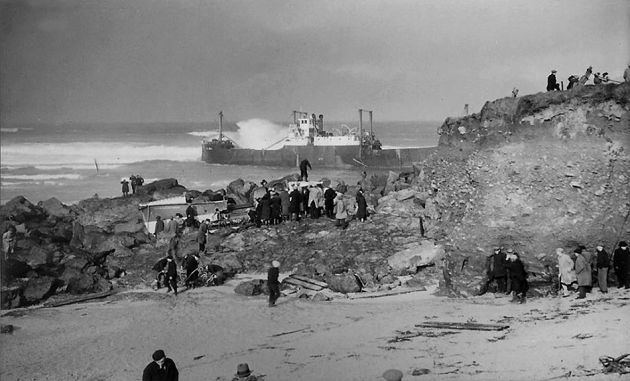 He survived, scrambling ashore as the lifeboat was smashed on the rocks. Bronze medals were awarded to Freeman and the other seven (what does it take to get a gold?!!) for their acts of heroism. The loss of two lifeboats in such a short time is unique to St Ives and reflects the extreme conditions that are faced along this coast. Over the years there have been two more Tommy Cockings at the helm of the St Ives lifeboat – the son and grandson of the one lost in 1939, and both have received medals for bravery. Today the lifeboat station has two boats; a D class inshore lifeboat (The Colin Bramley Parker) and the main offshore boat, the Mersey class Princess Royal. The Princess Royal (C.S. No. 41) went into service in October 1990 at a cost of £445,000. It has a range of 140 nautical miles and a maximum speed of 17 knots both of which are invaluable in covering the coast up to St Agnes.